Do not be alarmed, but the menfolk of two newly-identified species of desert bees look an awful lot like ants, and scientists have no idea why. In the latest issue of the journal Zootaxa, entomologist Zach Portman of Utah State University and his colleagues report nine newly-identified species belonging to the genus Perdita, a diverse clan of desert bees found throughout the American Southwest and adjacent parts of Mexico. These tiny, shiny pollinators, many of which measure just a few millimeters in length, play an important role in natural ecosystems of the Southwest, by spreading the seed of iconic desert plants like the Tiquila flower. New species of insects are discovered all the time—more often than not, through painstaking anatomical and genetic analyses that can separate close cousins. But every now and then, nature throws us something totally bizarre and clearly new to science. 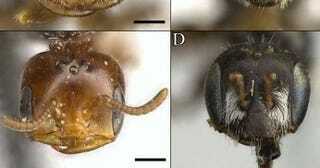 That was the case for two of the just-named Perdita species, P. prodigiosa and P. pilonotata, which are “sexually dimorphic with distinctive ant-like males,” the authors write. Recent genetic studies have revealed bees and ants to be close relatives, but still, discovering a bee with an ant head on its fuzzy little body was quite a surprise. And it’s going to take a lot more research to explain this striking example of convergent evolution. Also worthy of note: the new Perdita bees feature “hair baskets,” a mess of inward-facing, hooked hairs that allow the insects to collect pollen grains as they dive deep into tubular flowers. So, the next time Shia LaBeouf is spotted sporting an edgy new ‘do, you’ll know where he drew his inspiration.